A few years ago, two people with common interests met each other online. they quickly became friends, due to many common interest, and went on to become the best of friends they could have ever hoped to find - the only problem being they were from two different parts of the United States. April, being from Maryland, and Stephanie, being from Florida. But, that did not hinder their friendship at all. They emailed, messages and text each other at all hours, sending the longest messages their families had seen in such short spans that a joke arose that they should just ‘write a book already’. And of course, they loved that idea. The ideas began to work in their minds, and it didn’t take long for them to agree upon the subject of their future novel together - Vampires and Werewolves. The immortals on everyone’s mind. At the time, the were not very many Vampire and Werewolf novels around like there is currently (what with Twilight, Vampire Diaries, Trueblood, etc.) so they thought it would be a great idea to bring these immortals back into the light again after being inspired by Anne Rice’s vampire novels, Bram Stokers ‘Dracula’ and the movie ‘The Lost Boys’. The final idea - characters, plot, names and details - were all sorted with in a weeks time. It’s needless to say just how enthusiastic they were about this idea. Thus the writing began. You may be wondering just exactly how people co-write a book, and even more so, how they co-write a book when they live in two different states. They messages each other. A lot. Even more than before. They both agreed and accepted the chapters they would take, they would proof-read each others writings and give advice/critique. And so this process went on for 7 months until Hyblood, the first in the Wolva Trilogy, was completed. All these things and more were felt on that day, but little did they know they were far from being finished. Editing of the novel still had to be finalized before they could allow anyone to read it, the cover still had to be drawn and made into a cover, and there was that little nagging detail of just how one goes about getting a book written by two unknown authors published. But that did not get them down. The editing was finished, the cover was done,business cards were printed and ready to be handed anywhere and everywhere, and they happened upon a self-publishing website. To hold a real copy of ones own book, something you created and know better than anyone ever could, is a feeling you could not explain. Some words may touch upon it (pride, surreal, shock, glee) but none will ever fully describe it. Unlike many of the Vampire/Werewolf novels that are roaming the shelves of bookstores today, The Wolva Trilogy is not set in a modern day school, nor is it even set in modern day times - it is set in France in the 1800s. The setting and time was chosen for some very simple reasons - vampires and werewolves read best in older times, and France is one of the classic ‘birth places’ of all vampires (that and New Orleans). 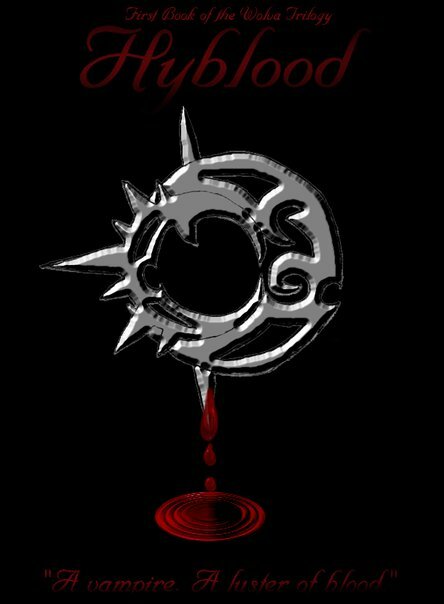 Hyblood, the first book, introduces you to the characters you will follow throughout the series, reeling you in to be attached to them as they go through the trials and tribulations of this story. The Hero will falter, the Villain will entice you to come closer, and the plot will keep you reading as you dare to ask yourself, “What’s going to happen to them now?”. You may now be wondering, just what on earth a ‘Hyblood’ and a ‘Wolva’ are, for you know you’ve never seen these terms before. But to answer that question, would be to give away parts of the story that are best found out in the pages of the novel. The goal behind ‘The Wolva Trilogy’ was to bring back Vampires and Werewolves in an appropriate light. To see them for what they are; immortal monsters, to see them for how they are to each other; eternal enemies, and to see just what could happen between them if the chance ever arose; a forbidden love. But do not be worried if you aren’t one who wants gushy immortals, Hyblood is full of murder, betrayal, lies and a sadistic Vampire leader who is sure to capture your attention. 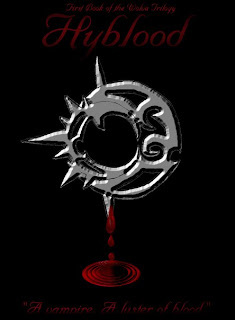 The dream for Hyblood now is for people to read and enjoy it around the world. To get to that point will be a long road, but it’s a journey worth taking. The characters of The Wolva Trilogy deserve to be read, loved and remembered. “In 1803 France, a young Frenchman named Gaspard, and his friend move out from the Paris orphanage they have lived in for over a decade. They find jobs at an old mansion and perhaps a friendship in the owners daughter, Jocelyn. You're symbol on the cover is very striking. I like it! Found you via twitter, what caught me was the 'we' write books, mainly because I'm also a co-author. Love to hear from other partnerships. It's funny, we're similar to yourselves in terms of dividing up chapters and giving feedback and critique to each other on finished chapters as we go!